Scientists at Scripps Research have succeeded in switching off addiction-like behaviors and reducing physical withdrawal symptoms in alcohol-dependent rats, by using a laser-based technique known as optogenetics to reversibly disable a specific set of neurons in the brain. National Institute on Alcohol Abuse and Alcoholism figures suggest that alcohol use disorder affects more than 15.1 million adults in the U.S. Prior work at Scripps Research has shown that the change from casual drinking to alcohol dependence occurs in parallel with fundamental changes in neuronal signaling that drive the cravings leading to increased alcohol consumption. Animal and human studies have also suggested that a region of the brain called the central nucleus of the amygdala (CeA) plays a key role in alcohol use disorders, the authors commented. “Chronic alcohol use alters CeA neuronal transmission, and the CeA has been shown to encode alcohol-related memories.” And while studies have also shown that activation of a specific neuronal ensemble in the CeA during alcohol withdrawal is associated with high levels of alcohol drinking in alcohol-dependent rats, “very little is known about the cellular phenotypes of these neurons and the brain regions that are controlled by this CeA neuronal ensemble.” There have been clues, however, with studies indicating that both alcohol use and alcohol withdrawal affect signaling by corticotrophin-releasing factor (CRF) neurons in the CeA. The George laboratory’s work has now found that these CRF neurons make up 80% of the implicated CeA neuronal ensemble. To investigate whether the CRF neurons are involved in alcohol dependence and withdrawal the Scripps Research team and colleagues at the University of Texas at Austin, and National Institute on Drug Abuse, harnessed a technique known as optogenetics to specifically and reversibly target this population of neurons in the CeA of alcohol-dependent transgenic rats. The optogenetics approach involved surgically implanting optical fibers that are directed to light up and reversibly switch off the CRF neurons. For their experiments the team first determined baseline alcohol consumption in non-dependent rats that were trained to self administer alcohol. The rats were then gradually made to become dependent on alcohol by periodically exposing them to alcohol vapor, which induced increased alcohol intake. Removing access to alcohol in these dependent animals triggered signs of withdrawal, and when access to alcohol was then reinstated, the animals increased their consumption even further. The scientists next investigated the effects of switching on the implanted lasers to reversibly inhibit the CeA CRF neurons in alcohol-addicted rats and control rats. Dramatically, the alcohol-dependent animals reverted back to their pre-addiction levels of alcohol drinking, and showed reduced physical signs of withdrawal. “At the behavioral level, we found that the optogenetic inactivation of CeA CRF neurons reversibly decreased alcohol drinking in dependent rats to levels that were similar to baseline alcohol drinking before the induction of dependence,” the authors wrote. There was notably no effect on these animals’ intake of water, or their consumption of saccharin. 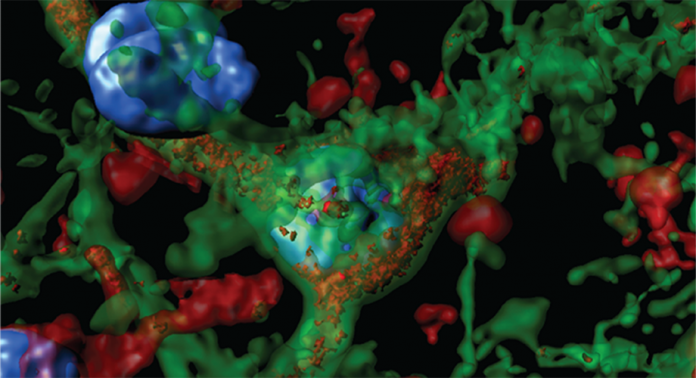 The effects of inactivating the CeA CRF neurons on alcohol consumption were also reversible. When the lasers were switched off to remove neuronal inhibition, the rats returned to their alcohol-dependent behavior. Further investigations showed that reduced drinking in rats subjected to optogenetic neuronal inhibition was linked specifically with those CeA CRF neurons that connected with a region of the brain known as the bed nucleus of the stria terminalis (BNST). Optogenetic inhibition of CRF neuron terminals specifically in the BNST led to reduced alcohol consumption, and less profound alcohol withdrawal symptoms. In contrast to blocking this CRFCeA-BNST pathway, inhibiting CeA-CRF projections into other areas of the brain had no effect on alcohol drinking in the otherwise addicted rats. Translating the findings into clinical possibilities will involve finding how to selectively inhibit the target CRF neurons, possibly using novel or repurposed drugs, or potentially gene therapy. de Guglielmo also plans to carry out further evaluation of which brain signaling pathways are affected when CRF neurons are inhibited. de Guglielmo reasons that CRF neuron projections into other regions of the brain may play different roles in alcohol addiction.